The Development Review Board meets the first Tuesday of each month as needed. All land development, exterior construction, change of use, and site work, requires review. Please call early in your project planning to confirm the need for a local zoning permit or to receive a determination that the property is exempt from local permits. Both applications are required for most new construction and only the Municipal Zoning Permit if the parcel is already developed. Fill out and return to the Town Clerk’s Office with the appropriate fee, or deliver to PO Box 98, Hyde Park, VT 05655. Call 802-888-2300 ext with questions. For all land development outside town and state road right-of-ways, signs, new construction, permit amendments or requests to appear before the Town DRB. The Development Review Board (DRB) meets when requested to consider applications for Conditional Use Review, Subdivision, and Site Plan Review and any appeals of administrative decisions. The DRB has adopted Rules of Procedure as required by State law to guide the board in the conduct of hearings and other procedures. 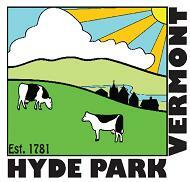 The Village of Hyde Park has separate bylaws administered by Karen Wescom at 888-2310. The DRB meets on the first Tuesday of each month, as needed. All meetings are open to the public. For more information, contact the Zoning Office at 888-2300 x2. Announcements of upcoming hearings online: www.hydeparkvt.com or at the post office and the town clerk’s office. The Zoning Administrator’s office is open Monday through Thursday from 9:00 a.m. to 4:00 p.m. There is one general permit application for all proposed land development activities which is posted at the town website, available at the town clerk’s office or by email: ron@hydeparkvt.com. Zoning permits are required prior to most land development activities so landowners are encouraged to contact the zoning office early in your planning process. The State of Vermont also requires that the town refer landowners to their permit specialist in Barre, VT at 802-476-0195. One or more state permits are required for most land development.